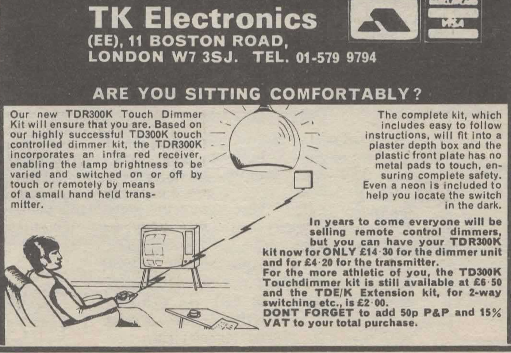 Everyday Electronics magazine is something I have fond memories of from my childhood. Much of the practical knowledge I have of electronics originated from things I read there or stuff I tried to make (some of it DID work). For many years my parents kept-up a subscription for me until sometime in the late-80s when I outgrew it. There is quite a lot of info online about EE’s sister publication Practical Electronics (which it would eventually merge with to create Everyday Practical Electronics) but I can’t find a lot written about EE. Recently I saw an edition of EE that recognised as one I originally owned in a second hand shop. At 20p it was an easy decision to take home. EE always put a bit of effort in to the cover which is one thing that makes them memorable. This one with the dodgy looking vicar and his assistant is perhaps memorable for the wrong reasons. The projects are typical of what I remember – endless variations on simple circuits with oscillators, discreet transistors, 4000-series CMOS and op-amps. 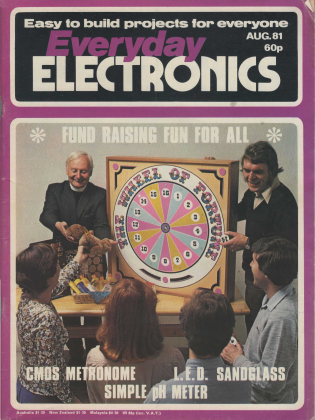 Even the cover project isn’t that exciting, though if you were in the market for an electronic wheel of fortune I guess it would do the job. They might have been basic and (whisper) not terribly useful but building them was still a great way to learn practical skills. The features are quite interesting and remarkably well considered in terms of content. Magazines like EE were the main source of information in the pre-Internet era and you can almost see how the different features mirror popular Internet content today. In “For Your Entertainment” Barry Fox makes some interesting comments on the current state of flat-screen displays before getting side-tracked in to a discussion of Sinclair’s doomed flat CRT project. The government didn’t half invest in some rubbish projects in those days. Some of the features do hint towards the tide of consumer electronics that would spell doom for much of the old hobbyist world. Another glimpse of the future is the side-bar on direct broadcasting by satellite in “Radio World”. The introduction of DBS as a platform for Sky TV was a huge step towards today’s media landscape. As a child, my favourite regular feature became “Counter Intelligence” by Paul Young. I liked his witty, caustic and grumpy musings on life in the kind of corner electronics shop that was already finding times tough. 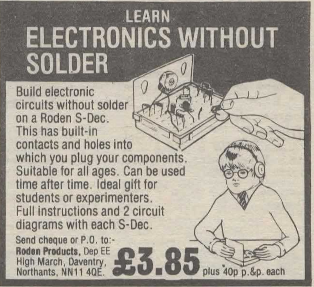 I remember that dad used to take me to a shop in Leicester staffed by blokes in beige lab-coats stocked with thousands of components in tiny draws. They hardly ever had exactly what you wanted but could usually produce something that would do the job. The adverts are a real blast from the past. Many of them seemed to run unmodified for years and years. The spiv zapping his light and the odd boy with his crystal set were almost permanent features. I imagine J Bull (Electrical) always doing deals on vast lots of unwanted items and then finding enticing descriptions to sell them off to the unsuspecting. So, for anyone who, like me, wants to wallow in nostalgia, or just see what the old days were like here is Everyday Electronics August 1981.